Sure, you’re likely aware that aligning your sales and marketing teams is best practice in the world of inbound selling. A Service Level Agreement (SLA) that defines KPIs and sets expectations for both sides is considered the most effective approach. But creating an SLA and changing lingering negative perceptions between the two teams might be a big ask of your company – how can you prove that doing so is going to yield results that make it worth it? Consider the following: Of survey respondents who have instituted a sales level agreement (only 22% – so you’re not alone! ), two-thirds describe their sales and marketing efforts as either generally aligned or tightly aligned. Only 11% consider the relationship misaligned. HubSpot found that the most successful organizations had two things in common: One was that they have an inbound approach, with the second being an established SLA between sales and marketers. 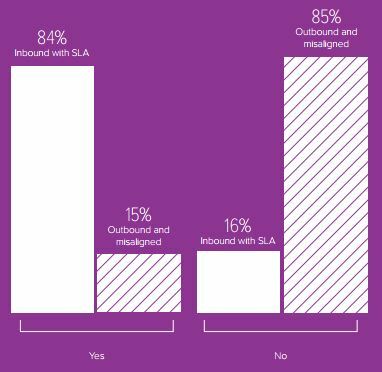 “Inbound organizations with SLAs are over 5 times more likely to rate their marketing strategy as effective compared to outbound organizations with misaligned marketing and sales teams,” the report said. Do you feel your marketing strategy is effective? And if you still don’t want to play nice with your sales team, marketers, consider the ramifications of your marketing budget. It turns out, those who feel confident about their marketing strategy are more than twice as likely to see a budget increase in the upcoming fiscal year over those who feel their marketing strategy is not effective. The core conclusion of the HubSpot research is that the less aligned Sales and Marketing are, the more negative the outlook for your marketing efforts. Can you afford to not institute an SLA? Need help crafting an effective SLA? Our blog covers what items you should define for optimal alignment. Creating an SLA then leaving it set in stone isn’t ideal – even if you’re one of the ahead-of-the-curve businesses with an agreement in place, make sure you’re constantly re-defining and refining it for greater understanding and cohesion.